On my bucket list when I planned my route for my round the world trip in position numero uno was the annual Edinburgh Fringe Festival in Scotland, the largest arts festival in the world. The Fringe was one of the few non-negotiables because if I was going to traverse the planet, by god I was going to see some good theatre in the process! And so that’s how I set my route around the world; it’s that simple really. Pick something you’re most passionate about and just do it! Well, after watching his favorites—it’s probably a good thing he warned me! Edinburgh Fringe is unjuried and entirely experimental for a lot of the Fringe performers. And while I certainly don’t offend easily, the more than a dozen shows I saw ranged from campy but skilled musicals to raw-and-gritty physical theatre—and everything lying between those two extremes. It’s the creativity that just kills me, I love that no two shows at Fringe were even remotely alike—there was nothing formulaic about it. 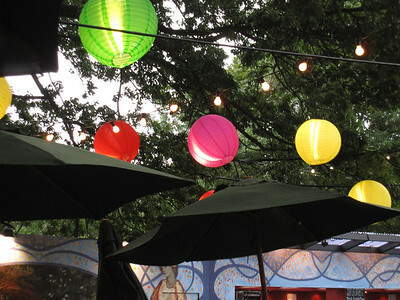 Zeitgeist was one of the most compelling shows at Fringe this year. The Zen Zen Zo Physical Theatre Company out of Australia put on a provocative physical performance that mixed Burlesque, Japanese, and Cabaret styles in a contemporary dance piece that had my jaw dropping and laughing in equal measure. Andy wisely suggested I avoid the front-row, and since I try to minimize the number of times I absolutely must wash my clothes, I was glad not to have saliva and chocolate hurled in my direction. I feel like I could just gush about the majority of the shows that I saw, but another notable performance was Baba Brinkman in the Rap Guide to Evolution. Brinkman is a self-proclaimed rap troubadour and I was blown away that he managed to make an hour of listening to Darwin’s Theory of Evolution interesting . . . and not just interesting, compelling and riveting. He drew parallels between the rap world and evolution comparing a rap artist’s “bling” to the extravagant fan of a peacock’s plumage. The dance and musicals shows were just so much fun, but another notable one included Ernest and the Pale Moon, a dark show infusing Hitchcock and Poe. I tagged along with Andy for this one and we both thoroughly enjoyed the amazingly simplistic and functional set-design accompanying the eerie live accordion music and engrossingly macabre story. I’ll leave you with that! 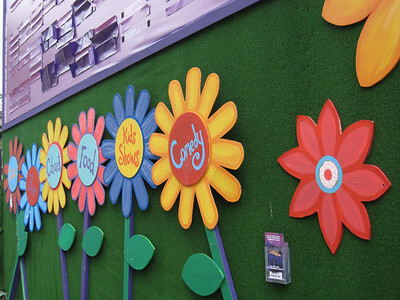 Those were my favorites—the best that I saw at Fringe 2009. There is a very real chance that I will come back to Fringe again in the next year or two because I was so thoroughly in my element; Edinburgh beats with the pulse of thousands of performers and artists for an entire month, that’s a temptation I may have to indulge in again! Exiting the bus station in Edinburgh, Scotland, the distant sounds of street music and cheering crowds lured me down Princes Street. Traffic bustled past me on the street, whizzing cars causing a passing breeze, and pedestrians vied for space on the sidewalk, eying me with caution since I had to backpacks strapped to my person. I had two hours to kill before my host for the next week would get off work, so that meant wandering the streets of Edinburgh in search of entertainment and grub. Stepping foot in Edinburgh was a culminating moment for me—in high school, I dreamed of attending university in the city. I eventually abandoned that plan in favor of a full-ride to a state school (and a summer study abroad in Italy, so don’t feel too bad for me!). And years later, when August saw temperatures soaring in Los Angeles, when my acting friends and I baked in the city’s dry, desert heat—that’s when I dreamed big. We would all take a group trip Scotland with the sole purpose of binging on the myriad Fringe Festival shows that annually take over Edinburgh for the month of August. Performers put on their best show and were decked out all over the city, even for street theatre! When I made the choice to take this RTW trip, I plotted my world trip itinerary with meticulous care. I etched Scotland onto the calendar in August as a non-negotiable. The Fringe has been an annual event in Scotland for more than 60 years and it’s the largest arts festival in the world. One of the biggest lures is the fact that it’s unjuried—that means anyone can take their show to the Fringe and no selection committee stifles the creativity of experimental theatre. The city swells in size during August and Fringe madness takes over in more than 265 venues spread across the city. I wikipedia’d the Fringe and was amazed that this year there were roughly 1,300 performances taking place each of the 25 days of Fringe—holy crap! I lucked out majorly with free accommodation for the week with David, a Scottish guy who I met way back in Australia so many months ago. As a backpacker, spending any real time in Edinburgh is cost-prohibitive. Without the free stay, I would not have been able to stay for the full week. That being said, couchsurfing is huge during August and residents are accustomed to taking in poor souls desperate for Fringe fun—I had several offers of floor space around the city if David fell through. Another stroke of luck? Connecting with Andy Hayes via twitter prior to arriving in Edinburgh. Andy had a press pass to the shows as a reviewer and my selection criteria for the shows was simple: I asked Andy which shows he would see again, if he could. Stay tuned this week for more pictures and fun stories from Fringe, the city, and an awesome Edinburgh Twitter coffee meet-up. After a week of uncommon hospitality given to me in Scotland, I surly owe a debt of kindness to other travelers—one to be repaid at some point in the future. On an icy-cold evening in Northern India, I met two sisters, fellow backpackers, who were nestled into a tiny restaurant in McLeod Ganj. We shared a table—there was not a seat to spare in the warm and cozy one-room restaurant—and backpacking stories during our hot meal. When we parted ways several hours later, they casually mentioned that if I headed to Scotland that I should stay at their mom’s house for a few days. Now, although the offer was genuine, all parties admitted that they didn’t think I would actually take them up it. Four months later, I did. I wasn’t even sure why, except that the chance for a local perspective, and a warm, quiet place to crash, sounded great. So, I spent a lovely four days touring the Scottish highlands and glens with Jeannie, mom of two other RTW backpackers on year-long journeys. Jeannie graciously opened her home to me and made it her task to show me Eastern Scotland’s highlights. We toured the highlands and glens around Dundee, Scotland, and these are my favorite photos and stories from my explorations! 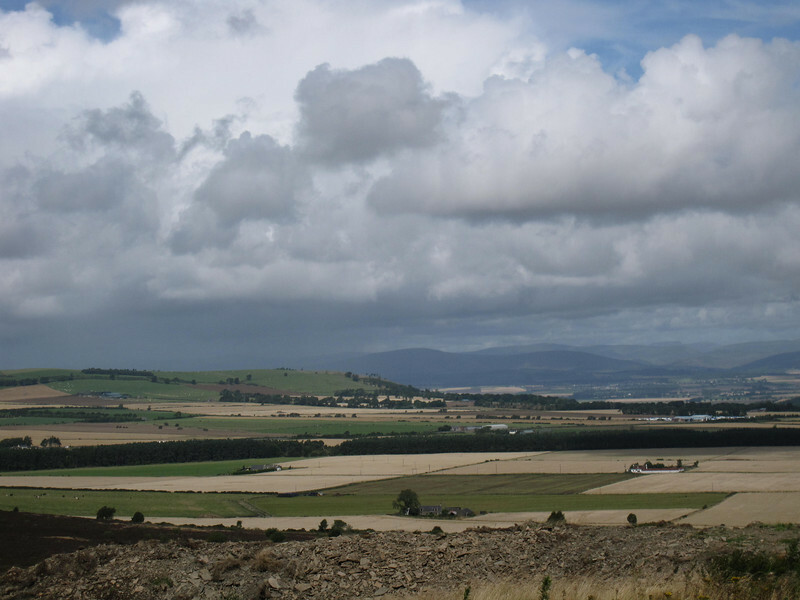 We hiked to the top of the gently rounded mountains afforded views of the River Tay, the North Sea and all of the low-lying farmland. 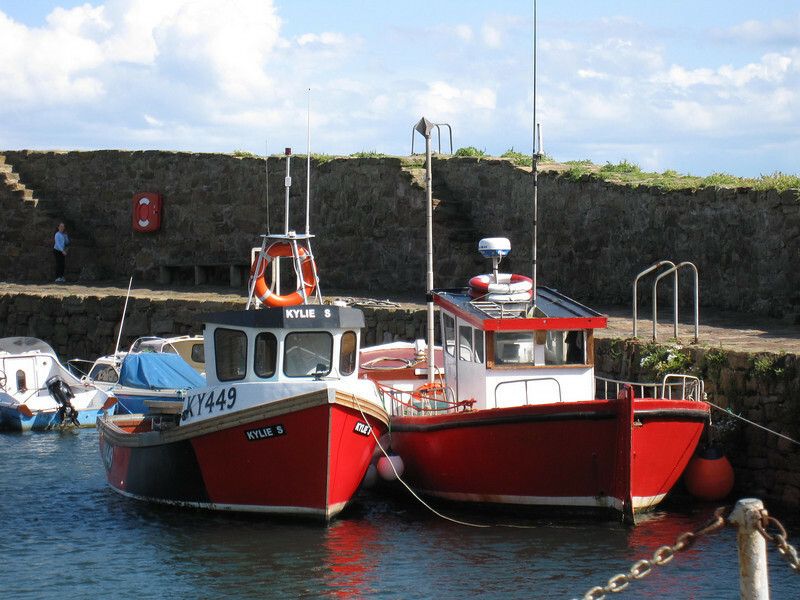 The small fishing village of Crail is quiet and quaint and dates back to 800 AD, when it was first settled. This place was utterly charming. Small pottery shops hide in the small side-streets and the perfect cuppa tea awaited us overlooking the sea at Crail Harbour Gallery. Big cities have a lot of interesting museums and a fast pace of life, but its villages that hold the heartbeat of culture and history, these hold the traditions of an older way of life. 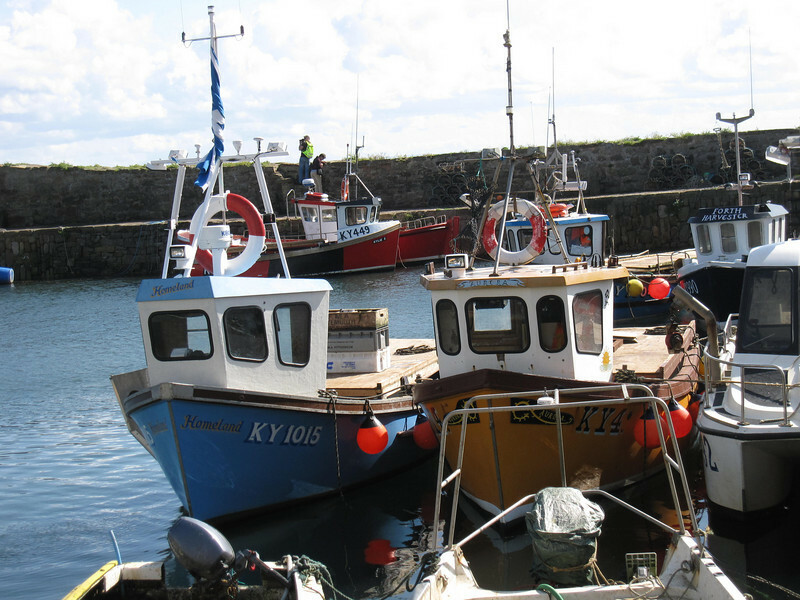 And even better, it’s just 10 miles from Crail Harbour to St. Andrews, which makes it very accessible as a quick stop. We parked in the village and then walked down to the Habour, had our tea, enjoyed the sunshine and perfect weather, before making the easy way back to where we had parked. When we left Crail, which truly is the prettiest of these East Neuk of Fife, we took a quick drive by Glamis Castle, which is where the Queen Mother spent her childhood. So charming, couldn’t get enough of the colorful boats! 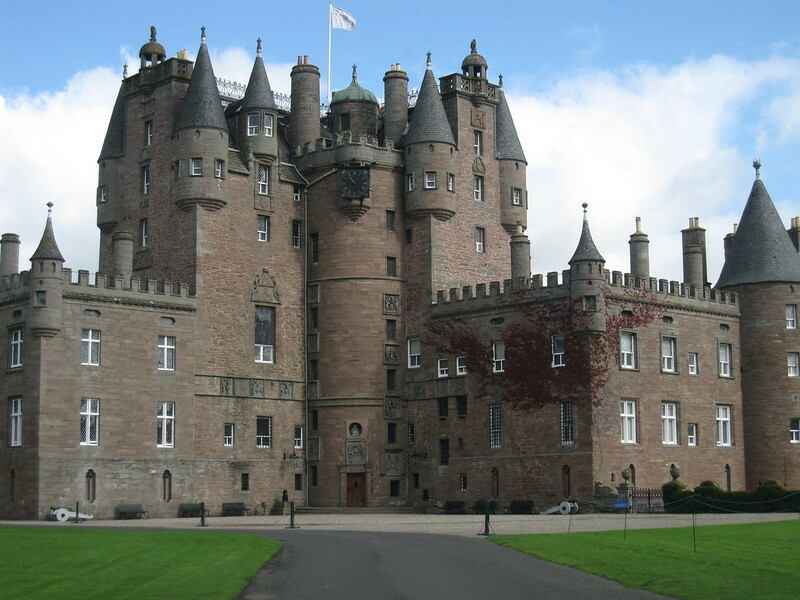 Scotland’s Glamis Castle, where the Queen Mother grew up. We enjoyed a warm fire and hot chocolate in Kenmore at a bright and roomy restaurant overlooking Loch Tay before heading to Fortingall to see an ancient Fortingall Yew Tree. 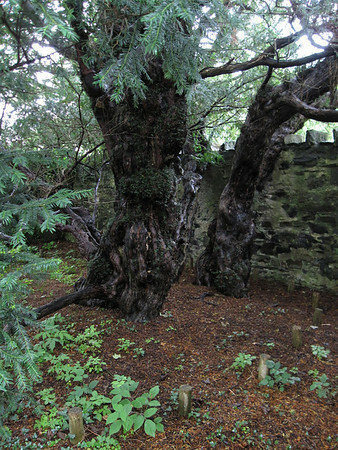 The tree is thought to be as much as 5,000 years old, which would make it the oldest living organism in Britain. Modern estimates put it closer to 3,000 years old, but really there is no telling. 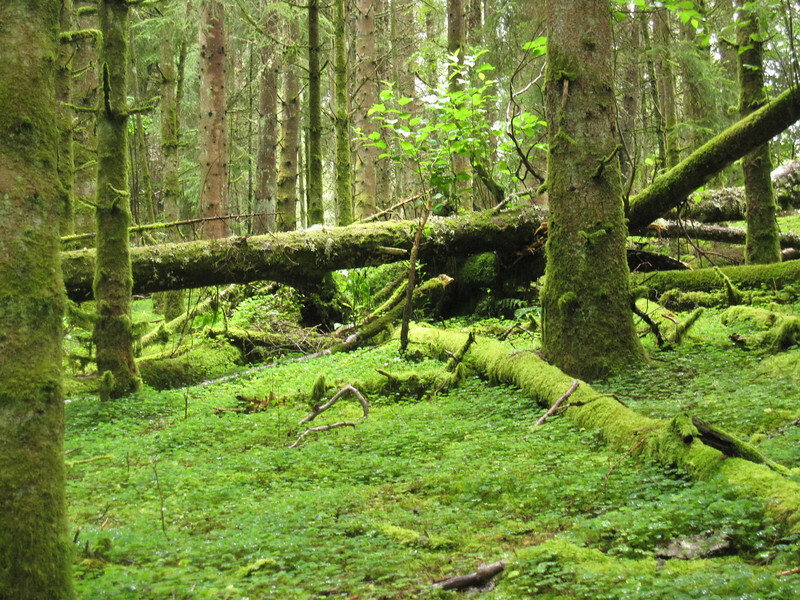 The base of the tree was once 56 feet wide—until souvenir hunters hacked at it! Natural erosion also took away other parts of the tree. Most of the space inside the wall of the tree was once tree trunk. 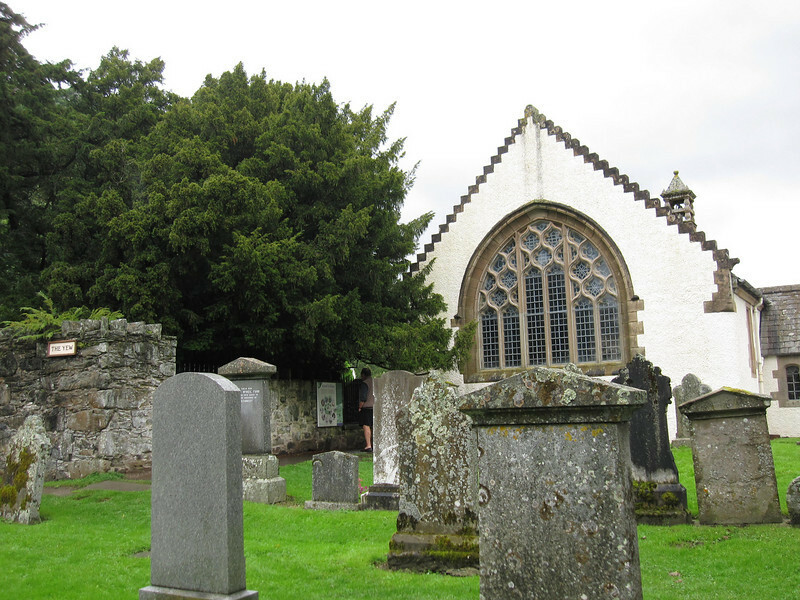 The ancient Fortingall Yew Tree. 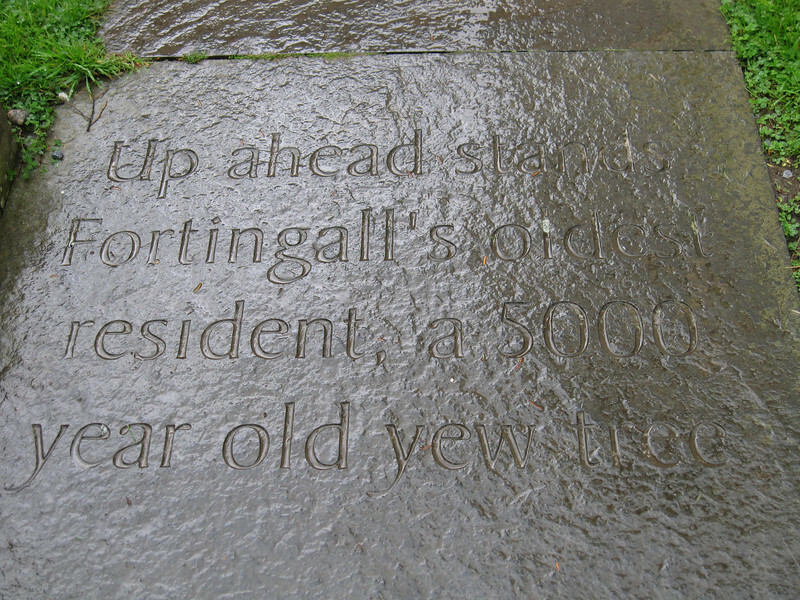 Inside the old Fortingall church. We hiked some in between the towns on our day trip to Crail and St. Andrews, and the Scottish hillside was abloom in gorgeous heather. I am a fan of folk music, and I couldn’t stop singing The Wild Mountain Thyme in my head while we hiked to vistas and viewpoints of the Scottish highlands and glens. St. Andrews is beautiful and worth a visit. I would have loved to spend a day or two poking around. The small city is best known for golf and for Prince William attending college there, but it’s so much more than either of those two claims to fame. I have a fondness for small cities (like my days poking around Stirling, Scotland). St. Andrews is charming and I thoroughly enjoyed this pretty little town. Gorgeous blooming heather in the Scottish Highlands during our August hikes. 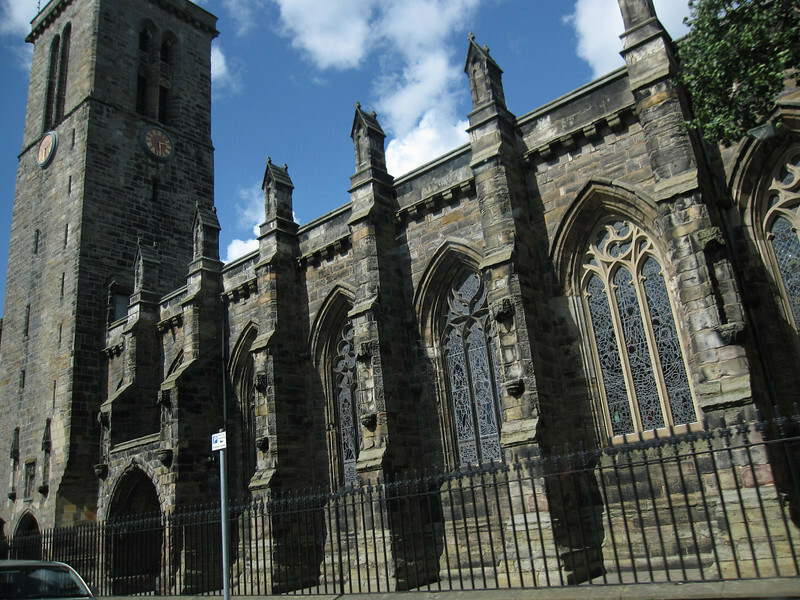 St. Andrews church is stately and beautiful. 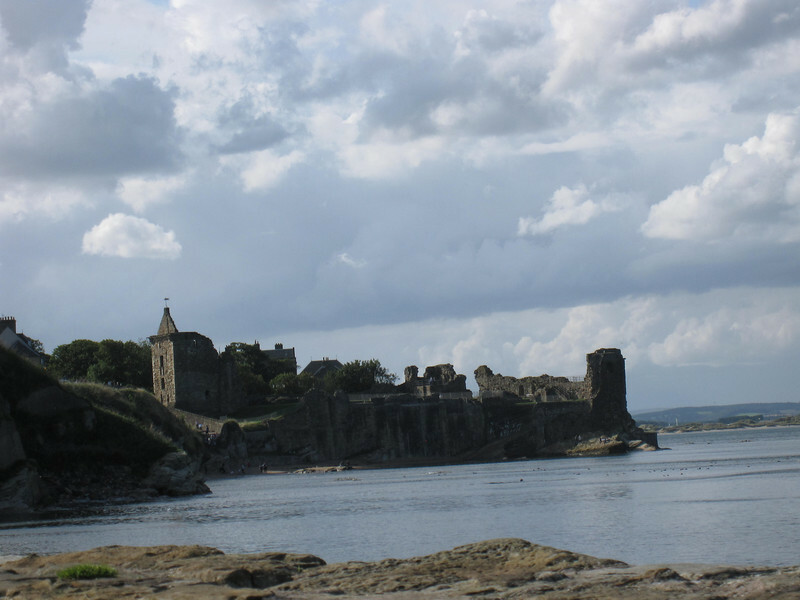 Views of ruins and coastline near St. Andrews, Scotland. Driving through eastern Scotland, through the country’s famous Scottish glens and highlands, has been an absolute highlight from my round the world trip. I can only extend an enormous thank you to Jeannie, because of her gracious hospitality I was able to explore the nooks and crannies of this area of Scotland. I owe one to the Universe now, and will repay it when I finally find a place to settle down. I have loved this insider’s take on the best hikes and towns, the stories of how Jeannie and her children enjoyed living this region as locals. 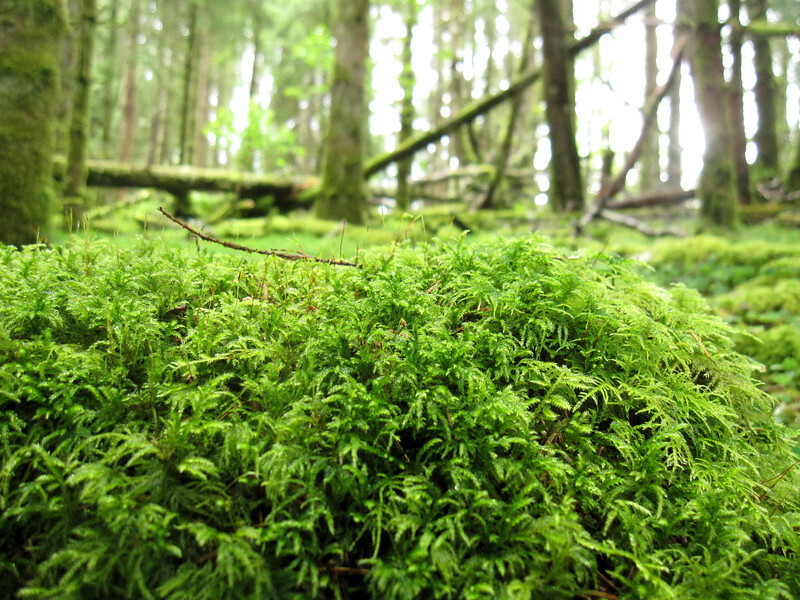 Vibrant green, lush underbrush climbed the trees and crept across the forest floor as soon as a left the main town of Fort Augustus in search of the best hikes near Loch Ness. Surrounded by national park, Fort Augustus offers easy access to hikes and it took mere minutes to leave my hostel and enter the darkly lit canopy. 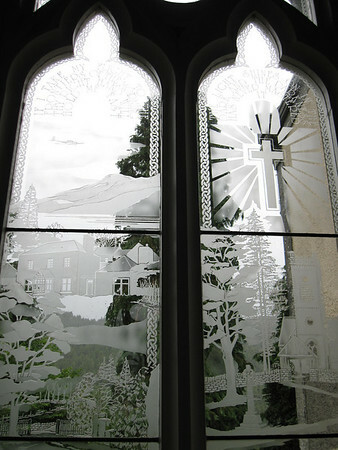 Fort Augustus has six major walks accessible from town and without a car—each takes between two to six hours. 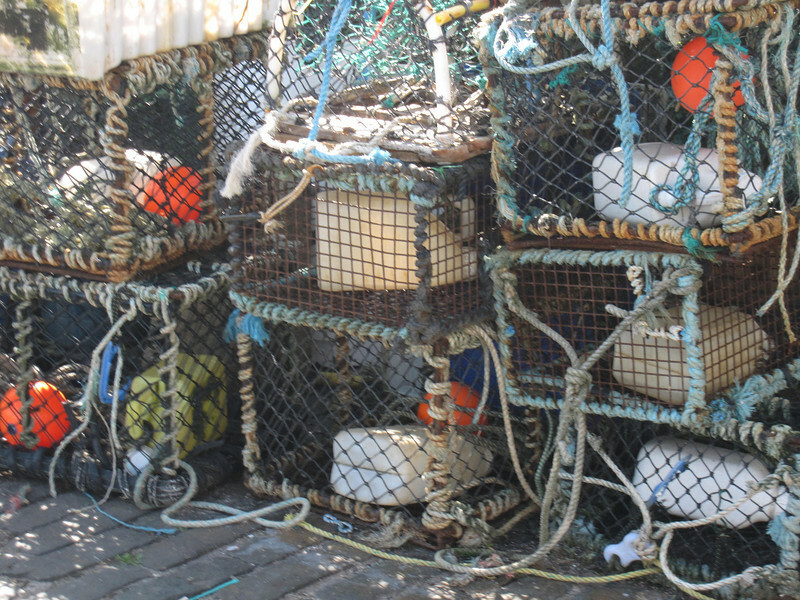 The abundance of options was one reason I decided to spend a week in Fort Augustus. I generally like small towns better than large ones, and I’ve spent my time busing around Scotland in search of not only the touristy (Isle of Skye), but the classic (Edinburgh) and the historic (Stirling), too. 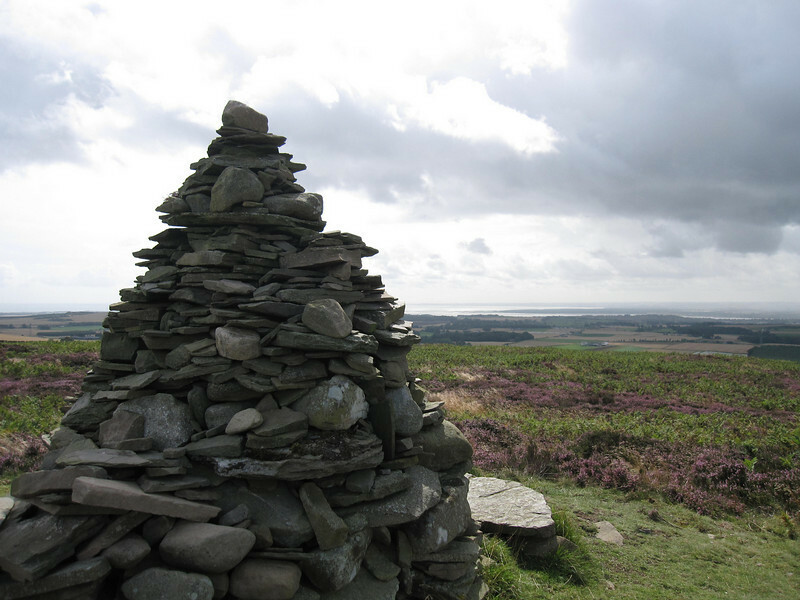 I structured most of my days in Scotland around great walks each day, quiet explorations of the smalls towns in the afternoon, and finding great local pubs with music and entertainment in the evenings. 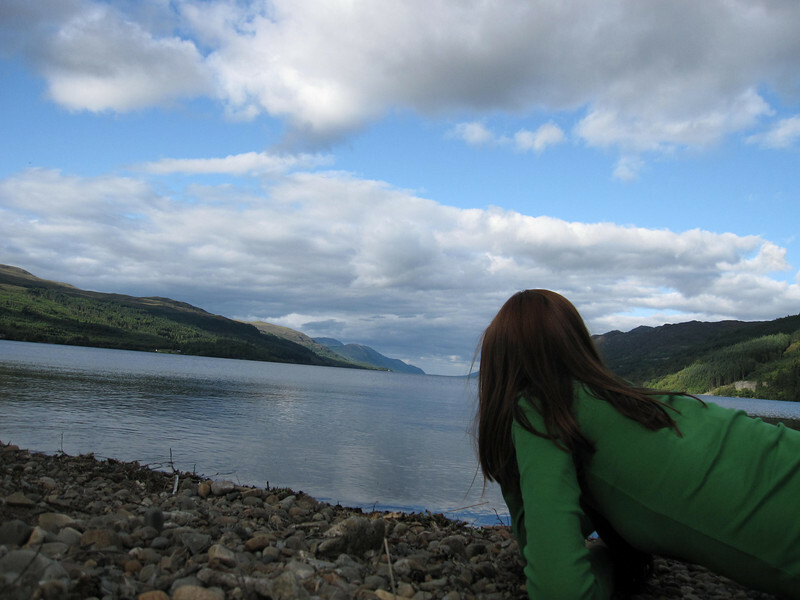 Looking out at the pretty Loch Ness unfolding in the distance. All roads lead back to town, essentially, so the woman at my hostel, Morag’s Lodge, told me to pick a direction and walk. 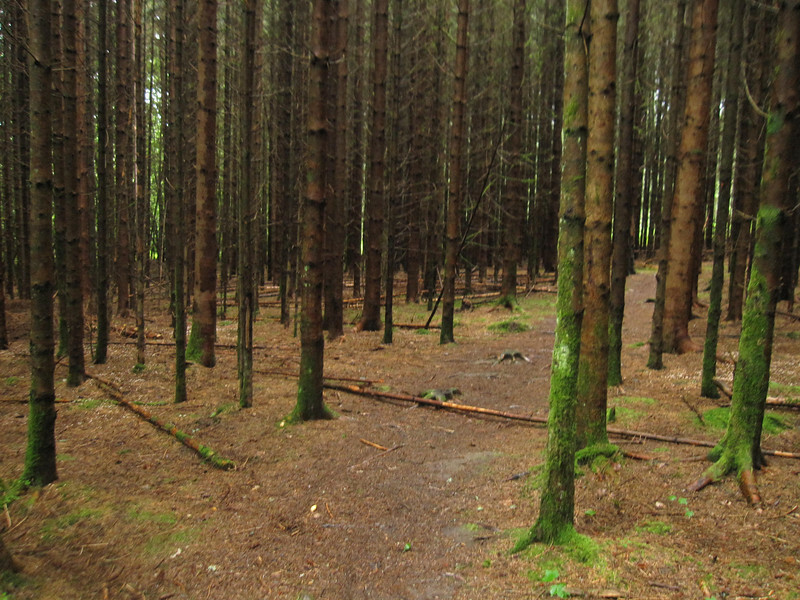 In no time, you invariably find paths jutting from the road and into the surrounding forest. Many paths climb to great vistas high above Loch Ness, where you can glimpse views of the shimmering blue through the trees. Others lead down to the swift-flowing River Oich. This river feeds Loch Ness and serene paths through the woods are empty of fellow hikers—these were peaceful walks. I love feeling lost and alone when I hike—empty paths are the perfect invitation to sing out loud (and off-key, I admit). Also, like any good hiker, I pack lunch and as I sing I search for perfect picnic spots, ones with great views, a dry shady spot, and no one else around. This is an easy walk and one families would enjoy, as well as anyone else who enjoys hiking near the sound of burbling water. You can walk to the starting point from Fort Augustus (have someone point you in the right direction out of town, then follow signs for Auchterawe and then River Walk). There’s a steep-ish bit at the start, but for most of the walk you are on well tread forest paths, and ones alongside the river. When I did this one, I added in lunch by the river and it took about 2.5 hours, but it’s under two hours if you’re just hiking round-trip from town. Here’s a step-by-step guide to the walk. 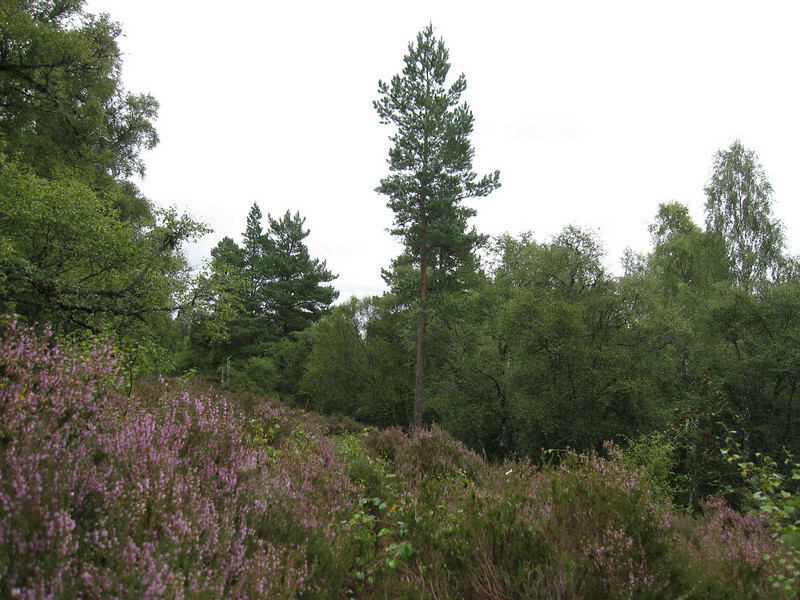 Part of the Great Glen Way, Allt na Criche is short and should be combined another nearby trail if you’re after a day out and a good workout, too—the Jenkins Park Walk is a good option. For Allt na Criche, there’s some steep at first, and you have a total ascent of 150m (492ft), but it’s short, so most anyone can make it. This trail starts two kilometers outside of town, so it’s accessible on foot, or there is a carpark for those with a car. For Jenkins Park, you’ll have some great glimpses of the lake and it’s quite pretty! Here’s a step-by-step guide to the Allt na Criche walk and a step-by-step guide to Jenkins Park, which easily links with the former. There are a lot of different ways you can hike the Great Glen Way, and you can always double back if some of these routes are too long. 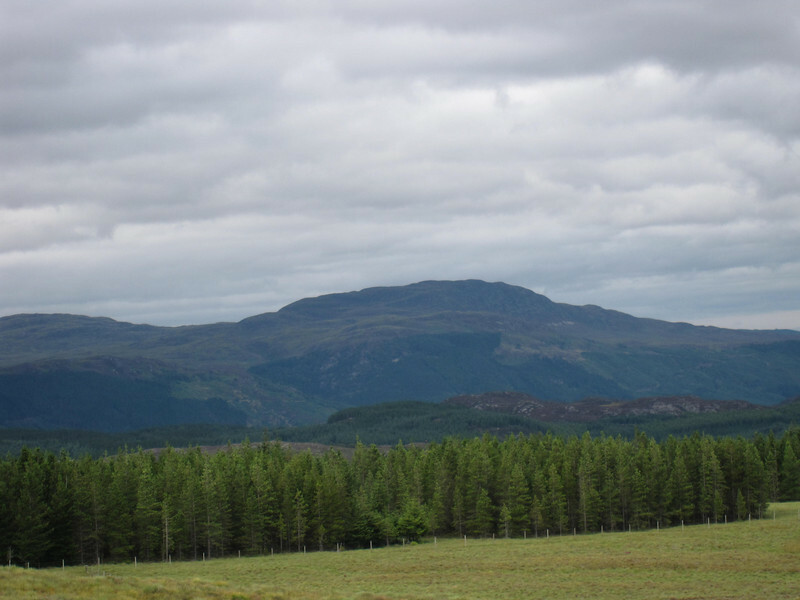 This walk is a good one if you want to combine a hike with some exploring of another town and then perhaps bus back to Fort Augustus (or walk back!). It’s 12km (7.5 miles), so give yourself about 3.5 hours to get to Invermoriston, where you can grab lunch at the one cafe. (To leave Invermoriston village, find Glenmoriston Millennium Hall, next to the main car park, where you can find toilets and the bus stop). Here’s a step-by-step guide to the walk. If you have a car, or time enough to bus to nearby hikes, there are some great ones. Consider the Loch Affric Circuit for a moderate-to-easy four hour walk, the Carn Eige and Mam Sodhail Hike which is challenging and at ten hours is for the fit and knowledgeable. So green it hurts! 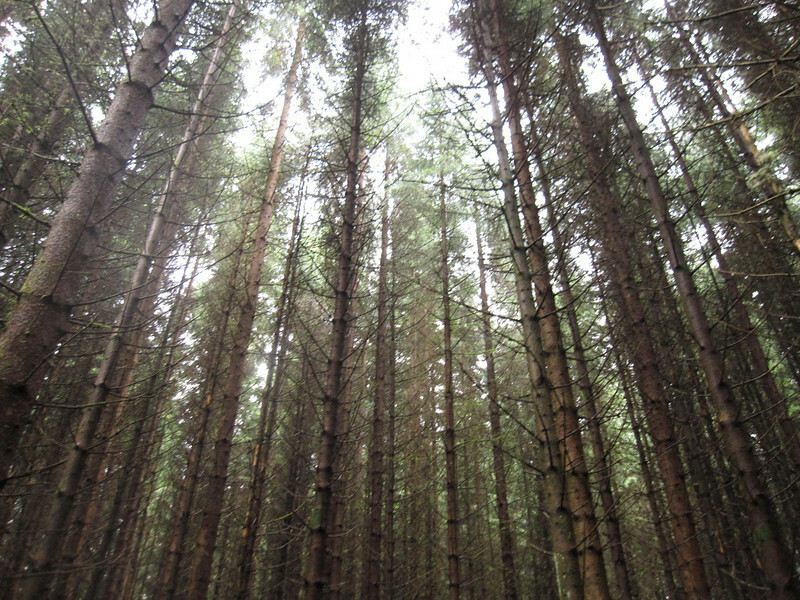 This is a #nofilter beauty from one of my forest walks near Fort Augustus. My favorite lunch spot was just a 15 minute walk out of town along the road, then a short walk across a cow pasture. I would like to say that it’s a secret spot, but a group of campers rowing the length of the lake actually found this gorgeous beach first. 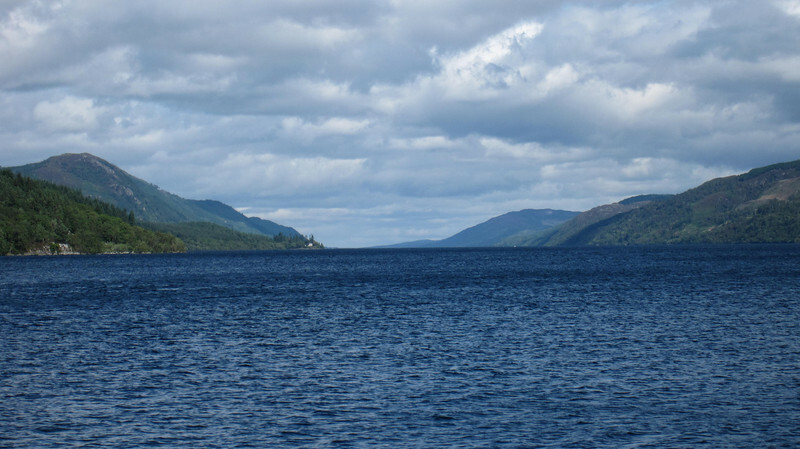 The spot, Borlum, is at the very tip of Loch Ness; the entire 23 miles of the lake unfolds into the far distance in a shimmery expanse of clam blue waters. Huge shady trees dot the bank of the eight-foot wide pebbly beach and it’s hard to convey just how gorgeous it was to watch the sun begin to set and cast its warm orangey-yellow light over the water. There are many tranquil walks in the region and I found Fort Augustus a pleasant and undeniably charming town, truly. It’s small but sweet and the town manages to nestle itself nicely between the forests, lake, and rivers. The gorgeous natural setting over-powers the chatter and bump of tourists that crowd the sidewalks (and there are charms to the tourists too, like meeting the famous Scottish piper who plays near the locks!). 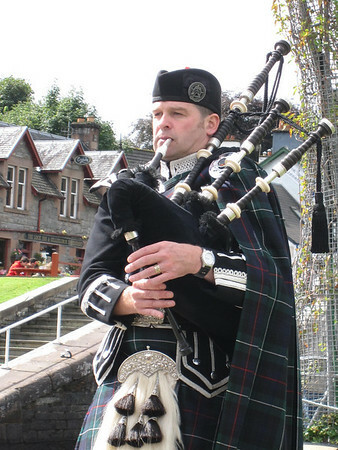 The faint lilt of a bagpipe rode the gentle breeze as I wandered to the main street of Fort Augustus. The town is small—tiny actually—and most of the action takes place along the Caledonian Canal, which feeds into Loch Ness. This is a busy passageway through the area since the canal connects several of the main Lochs (lakes), and uses an intricate locks system to safely move boat from into the calm waters of Loch Ness. 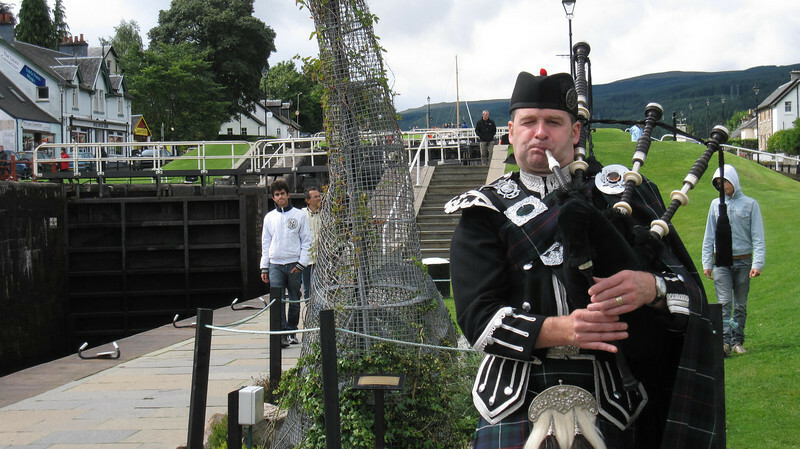 Although the legend and myth of Nessie is one key reason people visit this area, it’s also to see the locks and take in the sights and things to in Fort Augustus. Foot bridges span over the canal’s locks and tourists jostle for spots, especially when a boat moves through! Tilt the camera just right and aim for an arty shot. Fail. I have yet to discover a way to make the locks actually look interesting—I encountered this in Panama’s Canal Zone as well—but they are undeniably as popular as Loch Ness itself here in Fort Augustus. The bagpipes grew louder the nearer I made it to the central tourist area until I rounded a corner. There before me was a piper in full Scottish regalia piping out his heart to the small crowd of tourists. And while the intellectual part of me understands that the piper was piping specifically because of the tourists—because what normal person would wake up thinking, “Gee, perhaps I’ll put on this outfit and jam by the single most touristy spot in town”—it didn’t detract from the cool factor. Bagpipes are one of those instruments that most people (outside of Scotland for sure) rarely hear live. And that’s a shame because it’s beautiful. I settled into a cozy spot on the grass near the bagpiper, content to much on an apple and listen to him play. Tourists ebbed and flowed past the piper, many snapping photos and tossing him a few coins before heading to the locks and shops and pubs lining the canal. During one of his breaks, the bagpiper introduced himself to me as Spud—I would come to learn that he is a well-known bagpiper! We got to chatting and Spud felt the way many feel upon learning I am a born and raised Floridian: bewildered that I lived in such densely layered heat and humidity. I continued listening and relaxing—at least until Spud slipped in a couple of American nursery songs into his next set! That had my head whipping up, laughter bubbling out. Hearing “Skip to my Lou,” “Clementine,” and other such songs from his bagpipes seemed both anachronistic and highly amusing! Spud plays bagpipes regularly in Fort Augustus, most every day during the high season, so throughout the week I often aimed a friendly wave in his direction as I made my way to the tiny multi-purpose grocery store/café/ restaurant to pick up dinner fixings. And on my last day, I spent several hours listening and relaxing while waiting for my bus out of town, which is how I ended up in the hitchhiking debacle! Debacle aside, the interactions with Spud, the grocery store owner, and others is an aspect I simply love about small towns all over the world. Fort Augustus is one; I loved Český Krumlov most recently, and long before that I stayed an extra week in Luang Prabang just to soak in the good vibes. Staying a bit longer than the “must-see” things require lends new dimensions to what can seem touristy and one-dimensional.